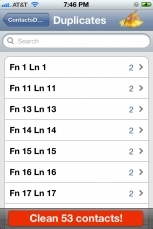 If you always have at least two iOS devices, let alone your laptop (guilty as charged; iPhone4S, iPad2), you know that within time, syncing your contacts leads to duplicate listings (I’ve had as many as a dozen for a single contact!). Going through them manually has been a necessary chore to clear out the cruft from time-to-time. Till now. Geez, could I gain more time to procrastinate all the other ecleaning that needs to be done? Contact Duster PRO is an inenspensive app. In fact, you can find the equivalent of a trial version for free, minus some features, available. If you find it useful, you can purchase the PRO version on the AppStore to add the rest of the features. You can edit your contacts manually. But the selling point is that you can “dust” the whole shebang with a single click! Or clean up sections, categories, et al. In no time. This app is blazing fast. It brought up my entire contact list (veral thousand) in a couple of seconds. It breaks down your list into several categories: all contacts, groups, zombies, and duplicates. You can view these in either list (for editing) or graph (to see just how much cruft is in there). Editing is straight forward. You can edit either by field or contact as a whole. The same goes for groups. And the app syncs up with your iCloud, so the app and your contacts are omnipresent. The concept is wonderful, an app to clean house for a specific app prone to clutter. Unfortunately, the execution is somewhat confusing. It turned out that I had pushed the ‘Dust It’ button. If I had pushed ‘Duplicates,’ all this could have been avoided. More on this in a little bit. Also, what it sent from my iPad2 to the iCloud to my iPhone4S differed wildly. Many more contacts had been removed by the time the changes had reached my iPhone. The single ‘The Petries’ reference that I had just referred to was nowhere to be found. Period. Be fair, I hadn’t checked my settings. But, then again, I could find no settings, in either the app or in My Settings. And this is my major complaint. A simple one sheet with instructions/explanations found by touching a ‘Gear Button’ would have saved me all of this bother. Contact Duster PRO is an app that has increible promise. Unfortunately, in it’s current state, it performs more like a beta just prior to alpha. 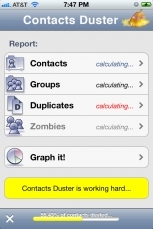 If you do a lot of business on your iPad or iPhone, this makes Contact Duster PRO a very indispensable tool. In fact, I would wager they could move just as many copies at a dollar more if they would adress it’s few shortcomings. My guess is that within the next several releases (see above update), all of these issues will be corrected. At which point, you’ll wonder how you ever survived without this app. Now, onto my Web Receipts folder (tax time, y’know!). This entry was posted on Wednesday, March 14th, 2012 at 1:18 am	and tagged with iOS software and posted in Reviews. You can follow any responses to this entry through the RSS 2.0 feed. « Op-Ed: Are We Jaded?